Don't find yourself hanging off the roof on your belly just to try to get a clog out of the gutters! Call our Mobile, AL gutter cleaning company instead. We'll get all the debris out of your gutters and clean up the surface so it looks new again. Our customers often come to us for gutter cleaning services several times a year. Gutter cleaning can be dangerous, but it's also very time consuming, so most prefer to hire our professionals. We have the tools and skill to do the work quickly and safely. Call us for a free estimate if you need help with any of the following. Our gutter cleaning service is very helpful to keep the downspouts from clogging. Clogged gutters don't route the rain and the debris can ruin your roof. The more trees you have on your Mobile area property, the more chances of gutter clogs. When your gutters don't do their job, your home's foundation is also at risk. Water pooling around the foundation washes soil out from underneath as it drains away. This leads to foundation cracks and shifting. Gutter cleaning minimizes the risk of roof and foundation problems. In addition to gutter cleaning, our professionals can also help you with roof cleaning, patio cleaning, house washing, concrete cleaning, and other exterior cleaning services. 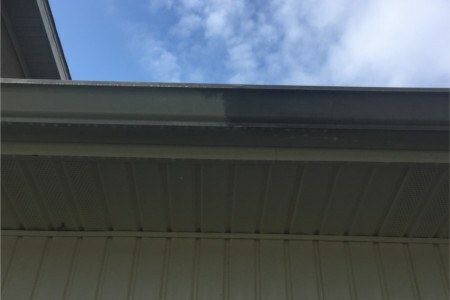 If you are looking for a professional gutter cleaning company in the Mobile, AL area, please call 251-263-5057 complete our online request form.